So, I must be frank, after the last licensed dressage show, I was feeling a bit dejected about our Third Level progress. There were some reality-check scores that made me question myself and my work. One judge told me that my collection was abysmal (I came to this conclusion from her 53% score of my ride), and yet another told me that my horse was lame (it was the last ride of the weekend and none of the other judges noted any lameness). It is amazing how those numbers and comments can strip any and all confidence you have in yourself and your horse. I even noted in my blog post that it was “death by comparison” with one of my better rides of the weekend. We came home from that show and have been working hard on all pieces and parts of our work. We’ve been trying to engage Ike’s hind end more which is no small feat given the length of his body. “Sit, Ike, sit” does not work as well as it does with the dogs. I am working diligently on not restricting the flow of his half pass. I even believe that we are starting to see improvement on the dreaded turn on the haunches. Just as we were getting our confidence back, it was time for vacation. I always panic that a week off in the middle of the season is going to set us back months. A week off turned into almost two weeks since my week after vacation was crazy busy. I ended up with one lesson and one 20 minute schooling session before it was time for our next schooling show. So as I am beating myself up about signing up for the schooling show, I come across a quote by Teddy Roosevelt, “Comparison is the thief of joy.” And it resonated with me. Stop worrying about the professionals and their uber-talented horses. Stop worrying about fellow amateurs with more experience. Stop worrying about not riding (you are the only one who cares…your horse does not care). Stop fretting that everything is not perfect. Just ride your horse as best you can and enjoy the ride….and that is what I did. I just rode. I stayed relaxed, smiled at my fellow competitors, and did not over react when Ike panicked when the horses were doing their jump rounds. Did we make mistakes? Yep. Our turn on the haunch to the right was a bit sticky and we earned a 5.5 for it, but it is better than the 4 that we are known to see on a regular basis. Ike misfired on his right to left lead change and got disunited. I then could not decide if I should stop and fix it, go to trot and fix it, or keep tapping with my outside leg and mentally will him to change the hind legs. I went with telepathy and the outside leg and he finally corrected himself – that earned us a 4 for the change and a 4 for the extended canter. Luckily the rest of our work was decent and we earned a 61.27% for Test 1. Our second test was Third Level Test 3. I’ve only ridden it once in competition, earning a 59.1%, so our goal was to crack the 60th percentile. I took a deep breath, exhaled and headed down centerline. The test flowed well through our trot work which was rewarded with scores from 6 to 7.5. An unforced rider error cost us when I completely forgot the halt rein back. Whoops! The highlight for me was earning 7’s for both of our turn on the haunches. Squeee!!! Our left lead canter work was better than our right lead. A jumping horse on the cross country course caused Ike a bit of worry, so the tenseness was noted in our scores. I think my biggest thrill was having the judge comment about how nice it was to see us moving on up and doing well. She provided some helpful pointers that we will use in our future schooling. And, drum roll please, we got a 63.85%! Yes! We made it into the 60th percentile. So maybe Teddy R. was onto something. Let go of the comparison. Enjoy the ride everyone! Today Mom and I celebrate 6 years together. I am really not certain why she likes to make a big deal out of the day I arrived in Virginia. 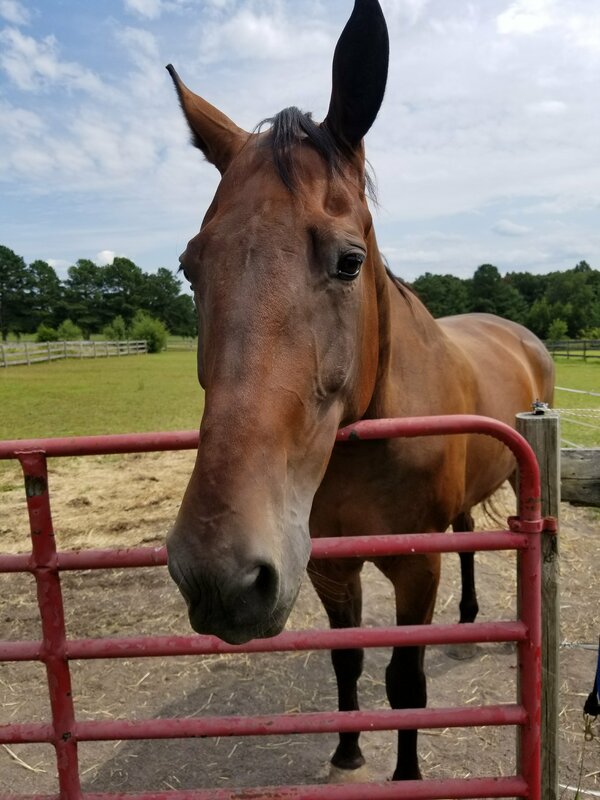 But every year she shows up at the barn on August 10th and screams, “Happy Gotcha Day Ike!” She babbles on about how it is nice to reminisce about how far we have come with our training and what we have accomplished. Yadda, yadda, yadda. Sometimes I think she sounds like a Charlie Brown school teacher. So let’s talk about what I think is really important – how HARD my life is compared to what my friends and brother have to do. Over the six years that I have lived in Virginia, I think I have done more work that all the other horses at the barn combined. What gives? Mom says that my brother has worked hard and is now enjoying retirement. I like mints, so I’m not sure why I don’t get to enjoy retirement. I wonder if it is a different flavor and if it tastes better. I ask Cigar to share his retirement, but he just ignores me or tries to bite me. Such a selfish older brother. And speaking of mints, I do not recommend eating them with the crinkly coating. It really does dull the flavor. And it seems that the longer I’m in Virginia, the harder my work gets. How can this be something to celebrate? I used to get to motor around the arena making big circles and straight lines. Mom made a big deal about me maintaining straightness in my work. Now, the crazy lady talks about bending my body around one of her legs and going sideways. And she and Ms. C talk about making me sit on my hind end. If I sit, how am I supposed to move? And they are all about making me move. Mom has a whip, Ms. C has a whip, Mom has things strapped to her feet that she uses to jab me. Go, go, go, but sit. I just don’t get it. I try to get Mr. D to rescue me from the two of them, but I think he has either been bribed or is in cahoots with them. Dad is my best hope for a savior. I’m pretty sure he is the sanest of them all, but since I don’t see him as much as mom, it is hard to get messages to him. Dad if you are reading this, save me from these loony toons. The rumor around the barn is that all my hard work has paid off and Mom got some sort of medal. The horses overheard her telling Ms. C that it is a rider award from USDF. Umm, how can it just be for her?? Seriously, I was with her for all the shows. I had to carry her around the tests; I had to huff and puff in the abominable heat, freezing cold, and pouring rain. (If you didn’t think she was crazy before, knowing this should push you in that direction.) What do I get out of all this nonsense? Personally, I think I should receive extra green hay and a whole apple a day. Reality is that they keep giving me timothy and other hay. I have to share an apple with my brother. Can you believe that? Sharing? But, besides the work, I really don’t mind living in Virginia. I get fed every day and have my own paddock so I don’t have to share with my brother. My brother is pretty cool except when he won’t share his retirement. Mom might be a bit loony, but she means well. She makes sure I get regular pedicures so my feet look better than hers. I even get chiropractic adjustments and massages. So cheers to another year together.